Because of privacy concerns, no List was printed on the back of the poster printed today. A new list will be made to be included in the next edition. All names on the NEW list must come with a request to be listed. Anyone submitting a name for someone else must have a statement that confirms their consent. I haven’t received my poster yet. How are things going? Thanks. We have started shipping posters in the order that they were received. You will get an email with a tracking number as soon as it is shipped. Thank you for your patience. I have not received my poster yet. I can’t get an account. The contact link doesn’t work. I can wait I just wanted to make sure I will get the poster. It means a lot to me. Thanks in advance for any advise. Hi Joan, The poster with names will be printed at the end of the month. WE have available the regular poster if you like. Would love to include your name and thank you for contacting Grandmother R. If you can send me your complete name I’ll put it on the list. Thank You! Misty, I can only add your name. The others either they have to respond or you acknowledge that they are aware and consent to have their names listed. Thank you. Please add my name June Sapiel. 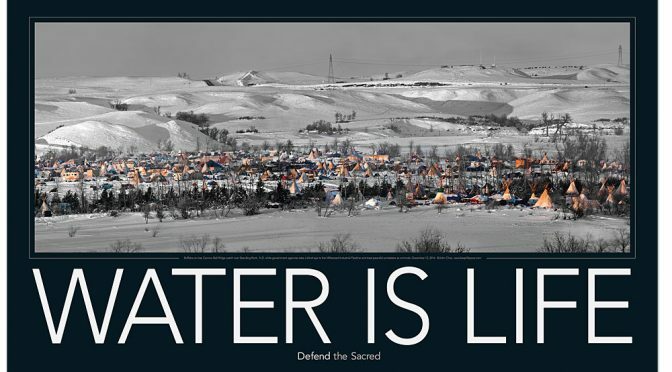 I was there on 4 occasions the last being at the sacred stone eviction. Thank you. I hear you! Who thought this was ok! Distributing a poster with all these names could lead to horrible consequences. STOP IT NOW!!! In order to list his name. You need to tell us if he consent for you to submit his name. altho I wasn’t able to attend, I send school supplies in October 2016 delivered to grandma Paperdoll, is it to late to add my name, or is just for the ones who live there daily, no problem, I follow all updates, shared all updates to the world, my hear belongs to this MNI WICONI forever. You are on the list. Thank you! Peshawbestown, Michigan October 2016 we were there don’t know if we were on the list or not. Thank you Susan. You need to let us know if you want to be on the list. How do you get your name off the list? It’s off. The names are not printed in the first edition. We will gather names for the second and only those who made requests will be listed. I didn’t give consent for my name to be on this list. This is dangerous. I get the intent to honor, but this list, as others have said, is probably being cross checked, and no name should be added without permission. Not to worry, we did not print any list and the list we will print will have only names of protectors who have given permission. I can only add your name, Candi. The rest you have to state that they consent for your to submit their names. This is needs to be taken offline immediately, people are requesting you stop endangering their security! An irresponsible project that needs to come off the internet. Has been removed and a new list will be started. I was an early organizer of the Omaha Run and Spirit Ride. Was at camp on and off from Day 1 til November (as a visitor/supporter, never did any of the amazing things the real deal water protectors did.) Add my name please. Thank you, Mni Wiconi! This is dangerous, a violation of privacy and consent, and insulting — talk about tokenizing to make a profit. You should take this poster down immediately. Shame on you. This needs to be taken down. Not everyone on this list consented to have their name published…not everyone on this list was even there! Good intentions, maybe, but poorly thought out. Please, please, please do your research! John Bolenbaugh IS NOT A HERO! There is an entire community deeply affected by the spill and deceived by John! He just seeks fame and money and has used this issue for his own benefit. Talk to the people and they will tell you them self. http://johnbolenbaughlies.weebly.com/ I know we need somebody like John but he is NOT the right person. I know who most of the people that are in bold print and I have to ask why they were chosen to be highlighted? We wanted to dedicate the panorama poster to have all the arrestees but was advised that it may be detrimental to many still facing trial. We ended up putting only of those in the public eye, meaning they are either reported in the news, or announce their arrest on the internet or requested to be acknowledged. In any case, we did not print the back on the poster and will start the whole process over by having protectors choose to be on the poster and not be nominated. I think what you are doing is a beautiful commemorative work to honor those who wish to be included. I understand the concern of those who did not consent to their names being included but the fact is if they were there if they posted any pictures or info about the camps they are already on any list that may exist. I personally would like this for my personal keepsake to pass on to my grandchildren some day. I would like my name included and any of the names I previously listed for inclusion given to you with the consent of the individuals named. Unless they have changed their minds and reached out to you directly please leave them on. Thank you for your good intentions. This list is harmful and violates privacy. You NEED consent when suing someone’s name and clearly there are hundreds of people who did not give you consent. Please take down this list. Please add, Samey Sully, Courtney Sully, Ida Ashes, & Ron Sully to the LIST! Is that Ida Ashes Sulley or Ida Ashes? This fight was sand is NOT about “personal glory”!! We do not do this to “gain honor”…we do this to honor the earth, to honor the ancestors, to honor the future generations!! To defend and stand together and expect to be honored or to outright ASK for it colonial thinking, brainwashing, at it’s worst. People, you forget who you are. Who you are meant to be! Do not be blinded by this so called honor of having your name posted. This is exploitation…..just as it has gone on for many years. This is someone making a profit off of others. And my name was in here but now it’s gone. Can you re add it?! This makes me so uncomfortable. I understand the desire for continuing to acknowledge the sincerity and power that was experienced in this unifying movement, but this feels like a complete commodification. John Chao, speak to people about what you’re doing and how it serves or doesn’t. You’ve created something very complex and triggering here – it’s not good. Please remove my name. I imagine anyone in their right mind would ask the same. Don’t worry Dylan, a new list will be made before it goes to press. The fist edition that was printed today does not have names. This is exploiting a prayer – the call was to answer a prayer and on behalf of indigenous resources. Once again a $ has been put right in the forehead of indigenous people – “take a picture with an Indian” style. Water Protectors went up there for a single purpose – not to get famous or be on a poster or trading cards. This is self serving and atypical of what is being done to this land and the indigenous. It shouldn’t even happen. This is literally a financial gain off the backs of Natives. And just as any other exploitation without permission. It’s not your right. Dawne, We will add your name but We will no longer add names without a statement that hey have approved and requested inclusion. We need to sue these sobs? Take this illegal post down!! Is this list only for those who were lucky enough to get out there or does it include people who sent donations and helped support the course by spreading the word via social media. My account was actually suspended for a time for spreading the word. Anyone who supported Standing Rock nd are willing to stand up with their name behind the message. But you will need to request to have your name listed. We are starting a new list and will include your name. Why you delete my comment? What do you have to hide? As an enrolled member– we did NOT give you permission to post this. Please remove or we will take legal action. Never deleted. All messages needs approval before posted. remove my name. you guys do not have my permission. wasicu mentality. take without asking. When this was first created did anyone think to ask permission to have these people’s names listed, since you are making a profit from their sacrifice, prayer and journey? While some people will have no challenge with their name being on here, others will feel disrespected. In our indigenous culture is is respectful to give tobacco and ask before doing anything that could potentially be life changing or that involves ceremony. I read the “creators’ of this for profit poster are from East Asia, so I am offering a perspective that you may not have known. Since this was/is considered a ceremony because people were there in prayer, there was several sacred fires, it is very important that this poster only contain the names of the people who are aware that their name is on here. There is protocol to follow and humble respect is required when any ceremony has occurred or is occurring. Anything less is considered to be disrespectful to the ancestor, the spirits, the people and the ceremony. Ceremony is never to be sold… that is first and foremost. Please consider what I have offered here with my words, heart and what has been passed on to me by my elders. I DO NOT SUPPORT THIS! What about the thousands who do? Please if someone submitted your name here, we will be happy to take your name out. You never consulted our tribe to use its name or likeness. We have consulted a lawyer and will be contacting you. I would be honored to have my name on this. 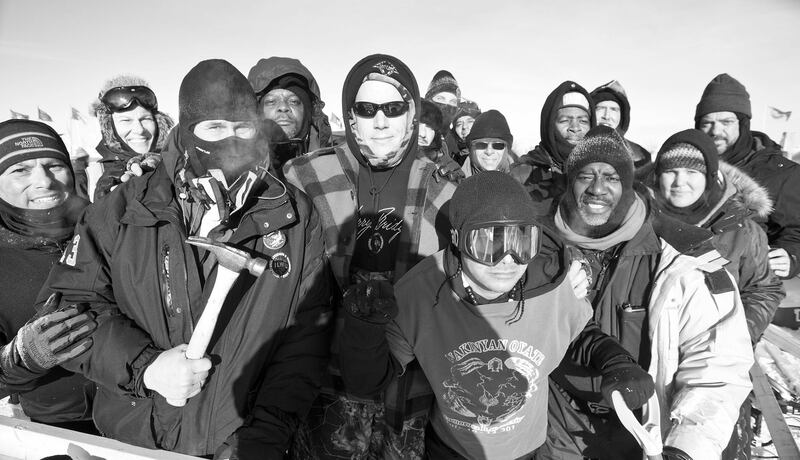 I left everything I had to move to Standing Rock to be a part of this struggle. Vincent Guerra. Honored to put it in Vincent Guerra! I spent my last $200 to stand for the water and my daughters too. We are not terrorists because we stand for life liberty and Justice. We are not violent for hearing the call of our mothers mothers mothers mothers through those who have remained to make the call. Add Stella Dreamwalker, Isabella Amhara, and She Who Feeds the Water (Ambriella). Thank You Stella, these posters are made to help you raise money for your stand. Thank you Jack, just not enough room.